The Big Game is right around the corner, and when it comes to game day food, there’s nothing I love more than a good queso dip. 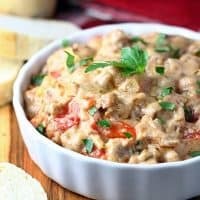 This year, I decided to switch up my usual queso dip and turn it into a spicy, delicious Italian Queso Dip. Trust me, everyone will love this! I often make ground beef queso, but I always keep some Johnsonville Hot Italian Sausage in my freezer, so I cooked it up and added to a blend of melted cheeses and other savory ingredients for an Italian-style twist on my usual recipe. 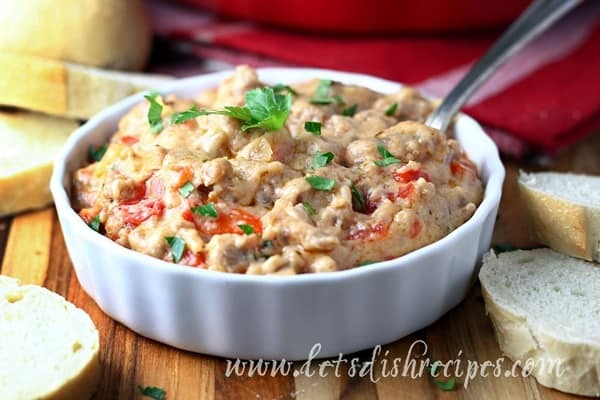 With the additioan of some sauteed red peppers and onions, Italian-style diced tomatoes and chopped pepperoncini, this queso dip was loaded with flavor! And because so many spices and seasonings are packed right into Johnsonville sausage, all I needed was a dash of salt and pepper to finish things off. 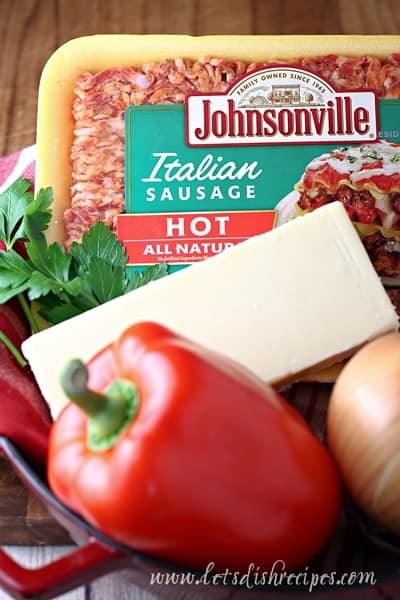 In fact, Johsonville Sausage is made by a team dedicated to creating the best sausage in America with choice cuts of meat and a variety of flavors and spices mixed in. Some of my family’s favorite recipes, like this Tuscan Ravioli Soup, or this Cheesy Sausage and Gnocchi Skillet, are made with Johnsonville sausage! 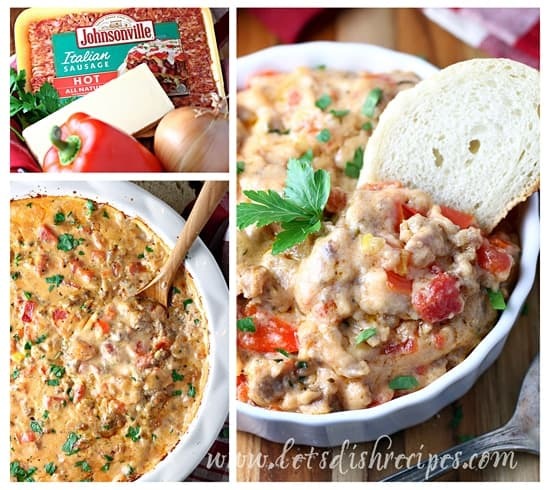 My family loved this dip, and they can’t wait to have it again on game day. And if your looking for more delicious game day recipes to try, check out Johnsonville’s Sausage Dome webpage. The Sausage Dome is a fun cooking competition where contestants–ranging from a 13-year-old chef to an Italian grandma–present their sausage-based Big Game recipes to a panel of six Johnsonville employees, also known as The Sausage Six. Be sure visit SausageDome.com to find out which big game recipe won the Sausage Dome and find Sausage Six Approved recipes for your own game-day spread! 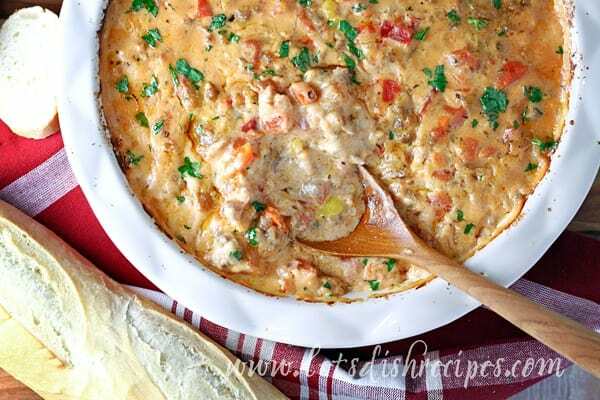 You’ll definitely want to include this Italian Queso Dip on your game day menu too! And it’s so easy to make. You could even prep everything ahead of time and put the dip into the oven just before the game. 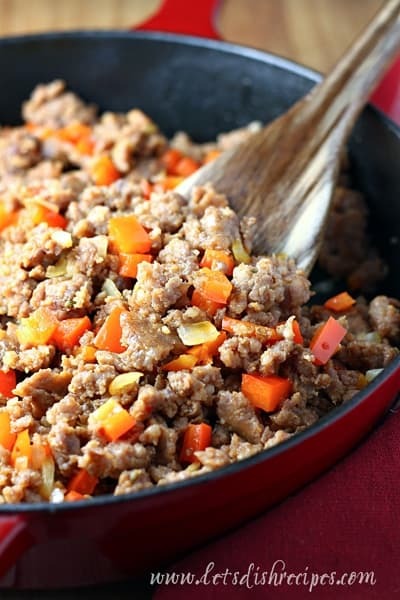 Once you’ve cooked up your sausage, pepper and onion, you add some diced tomatoes and a variety of cheese to the same skillet, and cook and stir until the cheese is melted and smooth. 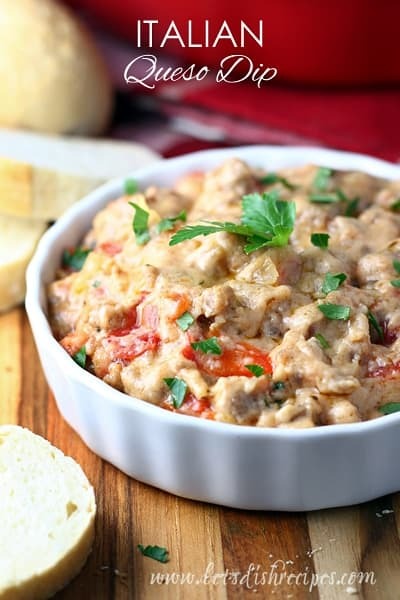 Then you transfer your cheesy sausage mixture to a baking dish, pop it in the oven, and 35 minutes later, you’ve got a satisfying sausage dip that is sure to be the hit of any game day get together! Hot queso dip, served Italilan-style with spicy sausage, red peppers, pepperoncini, tomatoes and three kinds of cheese! Preheat oven to 350 degrees. Spray a large skillet with non-stick cooking spray. Add sausage to skillet and cook over medium heat until sausage is browned. Remove sausage to a paper towel lined plate and wipe out the skillet. Add the onions, garlic and red peppers to the skillet and cook until tender, about 5 minutes. Return sausage to skillet, along with the cream cheese. Cook and stir until the cream cheese is melted, then add the sour cream and Italian tomatoes, stirring to combine. Add the American and Fontina cheeses and continue cooking and stirring until all of the cheese is melted and smooth. Stir in the chopped pepperoncini peppers. Transfer mixture to a deep 9-inch baking dish and cover with foil. Bake in preheated oven for 30 minutes, then remove foil and bake for 5-10 minutes longer, until dip is bubbly and light golden brown. Garnish with chopped fresh parsley and serve warm with baguette slices. This recipe makes enough to feed a crowd–perfect if you’ll be entertaining for the Big Game. If not, you can always half the recipe. One thing is for sure, this Italian Queso Dip was a hit at my house, and it’s sure to be a hit at your house too! Don’t foget to visit SausageDome.com for more great game day recipes featuring Johnsonville Sausage!